Tanzania, formerly called Tanganyika, is an African country that is situated just to the south of the equator. It is made up of the mainland area (Tanganyika) and the islands of Pemba, Mafia and Zanzibar. This country lies between three great lakes i.e. Lake Victoria, Malawi and Tanganyika. There are four climatic zones in Tanzania and these conditions favour the growth of various types of crops used to prepare varied Tanzania foods. The earliest known human beings who inhabited Tanzania were known to be hunters and gatherers. In this regard, the development of the indigenous Tanzanian food is said to have been influenced by developments in other parts of the world. In fact, as in 500 years AD, the growth of vegetables, millet, sorghum and fruits had begun in Tanzania. By 800 AD, Muslim travellers had introduced citrus fruits and commercial plants such as cotton to Tanzania. The process continued and at the moment, Tanzania boasts of its native food, food that every visitor who lands in Tanzania will not wish to leave Tanzania until he/she has tasted it. The foods are safe, nutritious, refreshing, adorable and generally rich. First of all, it should always be remembered that Tanzania borders the ocean and therefore always has a fresh supply of sea products including coconut and fish. Coconut bean soup is a special type of soup that is made from coconut milk as well as shredded coconut. It is one of the most loved foods since it is rich in various types of nutrients. This delicacy is enjoyed in various parts of Tanzania since it is a well-known food that is also suitable for vegetarians. Chai is a Kiswahili word that means tea. Chai is a common Tanzanian beverage that is enjoyed while relaxing and during cold seasons. It is a common beverage during occasions such as birthdays. It is normally consumed with special snacks called vitumbua’(small cakes made from rice). In Tanzania, it is called Chapati’. Chapati is made from wheat flour and it is one of the most delicious foods that you will ever find in Tanzania. Chapati is normally taken with other food such as stew and even tea. It can sometimes be used as a snack or offered as a meal to someone. In Tanzania, various types of bananas are grown and this is why banana dishes are common. Fried banana is a common Tanzanian dish that is identified as Ndizi kaanga’ by the locals. 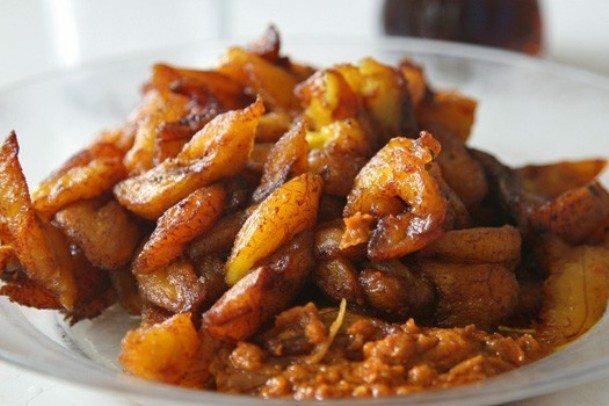 This type of food is made using various approaches but the bottom line is that it is highly nutritious and delicious so when next you want to try Tanzania food, try fried banana/plantain and you might become addicted if care is not taken. In Tanzania, this food is called Wali wa nazi’. It is another type of food that is made from coconut. Rice in coconut milk is a favourite dish to almost all Tanzanians and surprisingly, it has been adopted by neighbouring countries such as Kenya. You will hardly miss this food in Kenya’s coastal towns such as Mombasa. It is a typical food that is commonly cooked during religious and holiday celebrations. It is cooked from rice and several other spices with meat. This Tanzania food is best cooked using a flat/shallow and broad pot or better still; a big frying pan to keep the rice separate and unmatted which is a significant characteristic of this meal. With large quantities of plantain being produced in Tanzania, plantain-based meals are part of Tanzania foods that are eaten quite frequently. If you are a fan of soup, you will not wish to miss this African soup since it is what will make your visit a memorable one. The soup is made from chicken broth and bananas. It is a common meal at most Tanzanian beaches. Perhaps you are bored with common bread and you wish to take a different turn. The date nut bread will make your day. This type of bread is not only nutritious; made from coarsely chopped, pitted dates with added chopped walnuts, the ingredients used in its production qualifies it to be a safe product that is ideal for use by anyone. Do you love pudding? Then try the Tanzanian sweet potato pudding. Anybody who claims to have tasted all types of pudding should try this one. It is an awesome product that is produced from the local Tanzania food including sweet potatoes, cardamom and saffron. Makubi is a Tanzanian food that refers to a dish made from spinach, peanut butter and tomatoes. It is a balanced diet that is known to assist in fighting various dietary ailments. In reality, Tanzania as a country has a lot in store for everyone. It is a wonderful destination for those who wish to experience African delicacies. In fact, it has been identified as one of the African countries which value their native food. When next you plan to go for a holiday, think Tanzania and have a taste of Tanzania foods that will make you love this country more.